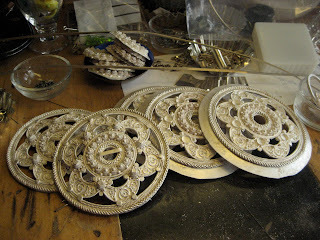 This is an in progress shot of the large medallion that is worn as a necklace looks like. She said it takes her about a week from start to finish to make one of these. All that fine detail she does by hand, wrapping a thin wire around to make a coil. Then making the coil flowers and soldering them all together. She really likes to refer to the traditional but still make it her own, something that I am trying to work out in my own work today. Earrings made from tires off a toy truck. I really think that these would sell like hot cakes in the US, but in Norway she said that they wouldn't sell (BH should do an international invite only show... haha). It one of those things that the artist has to make up for themselves when to say I'm only going to make this cause that's what makes me happy. On the other hand what sells that you really don't like to make? Everything that Gry makes in her studio now she enjoys making, but there have been times when she wasn't happy making the things that she was making. If and when I decide to switch up my work and make a totally different body of work then this is going to be one of those things that I'll have to tackle as well. Gry has a bright future ahead of her making the traditional pieces and fusing them together with the more modern pieces as well. If you have enjoyed this post then I encourage you to become a fan of Gry's shop name Fili on facebook. I have enjoyed my time here in Norway immensely and I hope to come visit again real soon! Gry outside her studio and where she wants to put a Fili sign up eventually. These are stunning! Great picks! Thanks Beth! Gry is a really amazing artist! Really amazing! She is so talented! Thanks for sharing your visit to Norway!